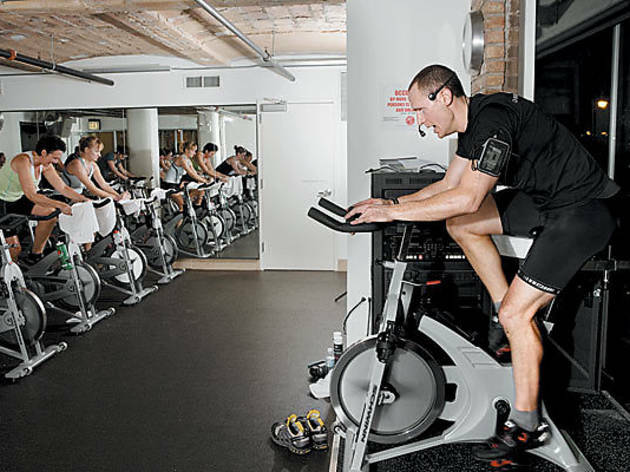 These spin classes will take you to hell and back, all while pedaling on a stationary bike. WHEEL ROCK YOU Triathletes dig Michael&rsquo;s Equi-triCYCLE class, which simulates an outdoor training ride. And makes your legs scream for mercy. Crap, everyone’s wearing bike shoes. That’s my first thought upon scanning my incredibly fit classmates as I enter the dimly lit spinning studio and climb on a bike, trying to hide my subpar running shoes. Turns out there’s a reason everyone looks so professional—nearly all of them are triathletes, and the instructor, Michael (also a triathlete), designed the class to mimic outdoor cycling training. That means tons of terrain changes and jumps, very few breaks and one of the most grueling spin classes I’ve ever had the pleasure of wanting to die in. As he mounts his bike facing the class, Michael announces this is an interval ride, meaning we pedal with serious intensity for the duration of a song, briefly recover, then start over again. The high-energy music, including “Human” by the Killers and “Since U Been Gone” by Kelly Clarkson, motivates us as we sprint in and out of the saddle and slog through climbs that feel like I’m dragging my legs through molasses. I’m used to at least 30 seconds of recovery between songs, but in Michael’s class breaks last for five seconds tops. About 20 minutes in, I start wondering if I might faint—fall right off my bike and knock the rest over domino-style. But that’s also when Michael jumps off his perch and roams around, shouting encouragement to everyone and busting out some air guitar. It’s hard to resist getting pumped up by his antics and enthusiasm, and I renew my conviction to finish this class. When the hour’s up, I’m entirely spent but coasting on a high that’s either a product of dehydration or pride—or both. Wednesdays 6:30–7:30pm. This 90-minute class splits its time between weight-training in one room and spinning in another, in 15-minute intervals. We start with weights, and our ferociously in-shape instructor, Heather, demonstrates various exercises like lunges, tricep dips and chest presses, then lets us do the reps while she walks around the room correcting our form. Then it’s on to the miniscule spinning room, where the bikes are arranged in a tight U-shape, so you’re awkwardly looking directly at the face of the person in front of you. Chipper instructor Haley leads us through a series of speed drills and climbs while I avoid eye contact. As the weight-training–spinning intervals continue, I get more and more exhausted, but I know if I took this class weekly, I’d be 1/18th as ripped as Heather. Thursdays 6–7:30pm. Can you get a good spinning workout in a 45-minute class? Yes, you can, with instructor Brent making sure you sweat every last minute. Repeatedly imploring us not to give up as we struggle through the intense class of jumps, sprints and climbs, Brent works just as hard, his shorn head dripping with sweat. Bikes are close together in two U-shaped rows, but the floor-to-ceiling windows on one wall and mirrors on two others keep me from feeling claustrophobic. Check crunch.com to find Brent’s winter class schedule. My classmates share inside jokes with überenergetic instructor Hisham as we set up our bikes in the giant, sunny room, making me feel like I crashed a party. But once we start pedaling, it’s all business. Hisham sings along to “Shaking the Tree” by Peter Gabriel and, sadly, “Right Here, Right Now” by Van Halen, stopping often to encourage us when the climbs get tough. During one of our last climbs, Hisham grabs my wheel to make the pedal stroke even more difficult—a nice touch. My only complaint: not enough climbing out of the saddle, which works your stomach as well as your legs. Saturdays 11:30am–12:30pm. Show up early to claim your bike or you’ll be SOL—this is a popular class. It’s easy to see why: Instructor Shelly’s small stature belies her loud-as-an-air-raid-siren voice (necessary to shout over the music) and unbridled enthusiasm. During our many climbs in and out of the saddle, Shelley often bellows, “Got room?”, which means, “Can you crank up that resistance?” No matter how tired I am, the answer is always, “Yes, ma’am.” Tuesdays 6–7pm.